Feeling frustrated that your body seems to have hit the "pause" button on your muscle and strength gains? If you&apos;ve been following the same training split for a few months, it&apos;s possible that your body has adapted to your regimen and stopped changing. Basically, your body is lazy. It will do everything it can to adapt to a stimulus so it doesn&apos;t have to work hard. After you pass the beginner phase, during which your body has no idea what you&apos;re doing to it, it&apos;ll begin to recognize your training and modify itself just enough to perform your workouts. If your body knows what&apos;s coming, it&apos;ll take the easy route to get through it. The key to overcoming plateaus like this is variation. Stress your muscles into growing and getting stronger by changing your workouts. Need more specific advice? These Cellucor athletes have a few tricks up their sleeves. Here are five ways they vary their training regimens to ensure consistent gains! Sometimes, one muscle group may not respond to training the way other muscle groups do. Occasionally, the best way to get a particular muscle group to grow is to not train it. "A week off training [a stalled] muscle, along with an average of 8 hours of sleep each night, will often do the trick to get through any plateau," says athlete Craig Capurso. "Make sure to eat over maintenance this week, as well," he advises. "Try to eat at least 200 more calories than you normally do each day." If you&apos;re not sure how many calories you should be eating for maintenance, Craig recommends using the Mifflin-St. Jeor method for calculating your calorie requirements. Craig&apos;s advice to eat more is usually the best way to build muscle. You will see greater muscle gains when you&apos;re in a calorie surplus and have enough fuel to build new tissue. So, unless you&apos;re cutting to compete, it&apos;s vital to constantly evaluate your diet to ensure you&apos;re in a surplus. As you build more lean muscle mass, your metabolic rate will go up. If you don&apos;t bump your calories to accommodate that change, a plateau is almost inevitable. In other cases, a full break from the gym may be in order. "Take a week-long hiatus from training," says bodybuilder Calum von Moger. "Chances are you&apos;re stuck in the same routine doing the same exercises, split, reps, sets, and so on. Getting away for a week will give you a physical and mental break from it all." Von Moger also points out that taking a break can help heal any nagging injuries. Sometimes, the best way to give joints and muscles a chance to recuperate is to just let them rest. You&apos;ll feel better when you get back in the gym, and often your strength can improve. "During your break, take time to figure out how what changes you&apos;ll be making to your workouts," adds von Moger. "Your mind will be antsy from the week off, so when you come back, you&apos;ll be hungry for results again." When she feels like she&apos;s on the verge of hitting a plateau, athlete Karina Baymiller adjusts her programming. "Change up your current training split and work in a rep or set range that&apos;s higher or lower than what you&apos;re currently working at," she advises. Doing lighter sets of more reps won&apos;t destroy all of the previous gains you&apos;ve made. Using a lighter load will allow you to focus on form, speed, and your mind-muscle connection. You&apos;ll notice that, after you come back to lifting heavier weights with fewer reps, you&apos;ll feel stronger and more confident in your lift technique. If, on the other hand, you&apos;re constantly working at 12-15 reps, lowering your reps to work specifically on strength gains can have a huge impact on your muscle growth. Remember, your muscles respond to stress. If you&apos;re stressing them by making them lift extremely heavy weight, they&apos;ll get bigger to accommodate your needs. Straight sets are absolutely effective, but if you&apos;re struggling to make consistent changes, then it&apos;s time to use some more advanced techniques. "Utilize partial reps, negative reps, giant sets, pre-exhaustion training, or supersets," says Calum von Moger. "With these techniques, your muscles won&apos;t have a choice but to adapt and grow bigger and stronger as you progress." Fitness model Jen Jewell&apos;s favorite advanced training technique is the dropset. "Whenever I feel like I&apos;m hitting a plateau, I like to incorporate dropsets into every workout for about four weeks," she explains. To perform a dropset, work to failure on a given exercise, immediately drop the weight by 20-25 percent, and rep again to failure. You can continue dropping weight and repping to failure until the target muscle group is completely exhausted. If you choose to add dropsets into your lifting routine, pay attention to your recovery. This technique is difficult and will be hard on your body. Allow each particular muscle group a few days of rest before you hit it again. If you increase the volume too often or with too many muscle groups, you may find that you just burn out rather than get stronger. The type of equipment you use can influence how your muscle is stimulated. "I&apos;ve found that switching from dumbbells to cables, kettlebells, barbells, or even machines can help me get past a plateau and see faster results," explains Jewell. "Anything to create some muscle confusion and remix your fitness should help stimulate change." If you always do barbell bench press, switch to dumbbells. Or, if you&apos;re always doing rows with a dumbbell, switch to a low cable. Not only will these changes help you push past sticking points in your progress, but they&apos;ll also help you stay interested in your workouts so you don&apos;t get bored. The key to a killer workout starts hours before you hit the gym. 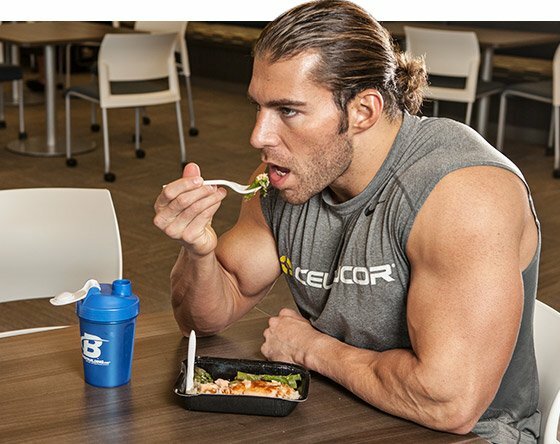 Here&apos;s what 5 Cellucor athletes do to prepare their minds and bodies for a great training session.